Dear Asian Pacific American Staff and Faculty Members of IUPUI. 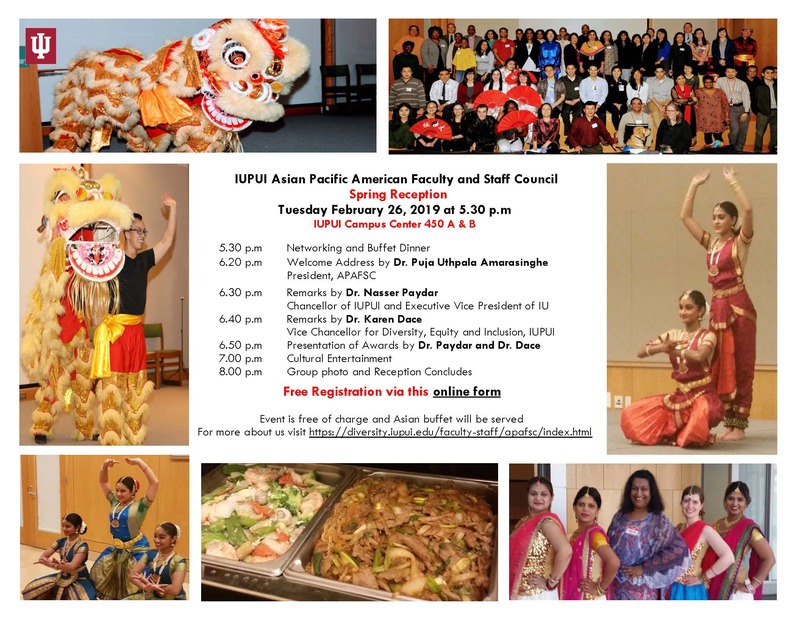 We, the President and the Executive board members of the APAFSC, invite you to the 2019 Spring Reception of the Asian Pacific American Faculty and Staff Council. The chief guest will be Dr. Nasser Paydar, Chancellor of IUPUI and Executive Vice President of IU, and the guest of honor will be Dr. Karen Dace, Vice Chancellor for Diversity, Equity and Inclusion, IUPUI. Please see the invitation above for the agenda and the registration link. This event is free of charge and an Asian buffet will be served. Cultural entertainment will also be performed. We warmly invite you all to attend the APAFSC Spring Reception 2019.